Welcome to Desert Hills Golf Course! The #1 choice of golfers in Yuma for generations! The Desert Hills Golf Course exists to enhance the quality of life for Yuma community members through physical fitness, competition, spirited fun and by being good stewards of the community via professional turf management. The course features 6,800 yards of challenging elevation changes and scenic views with an interesting mix of terrain. Desert Hills is a par 72 championship course, and is a meticulously maintained true test of golf. The course has been host site of several professional events including the Ben Hogan and Nike Tours. PGA Tour stars like Tom Lehman, John Daly, Paul Goydos and Chris DiMarco all played golf at Desert Hills. Rolling hills, open fairways, and large, undulating greens combine to make this the favored area golf course. Desert Hills Golf Course has been voted Yuma’s Best Golf Course 16 of the last 17 years. The golf shop features a wide array of golf apparel and equipment, plus custom golf club fitting and golf lessons from a golf instructor. Practice areas include a driving range, four putting greens, three chipping greens, and two warm up bunkers. Other facilities on site include an eighteen hole Par 3 Course, FootGolf Course and ten hole Short Game Course. The courses are open every day of the year except Christmas Day. 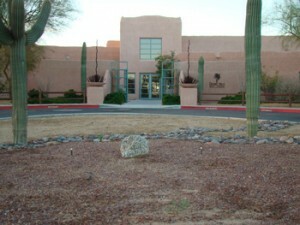 The Desert Hills Clubhouse features The Patio Restaurant and Bar. For those on the course, there is a snack shack as well as a friendly concession cart operation during peak season. The Patio can host special events with 10 to 175 guests for weddings, banquets, anniversaries, and meetings. Golf Course Hours of Operations: Times are mountain standard time (note: Arizona does not observe daylight savings time). The first tee time is at sunrise or 6:00 a.m., which ever is later. Copyright © 2019 Desert Hills Golf Course All Rights Reserved.